The following list is a work in progress, and is essentially an online notebook of information on Civil War veterans buried in George C. Yount Pioneer Cemetery in Yountville. The initial list of Civil War veterans was compiled by Denise Ratterman Jackson, and published in 2016 in her online book entitled, Veterans of the George C. Yount Pioneer Cemetery (which includes veterans of all wars buried in the cemetery). Her list serves as an invaluable tool for continuing research into the lives and Civil War service of these men, and my sincere thanks goes to her for her efforts. This page builds on Ms. Jackson's initial finds, with additional biographical material and expanded details on the Civil War service of each veteran. This page should be considered a continuously evolving work. As more information comes in, it will be posted here. It is also quite possible that there are other Civil War veterans buried in George C. Yount Pioneer Cemetery who have yet to be identified. If anyone reading this has corrections or additions, please let me know. Your comments are welcome! Scroll down to use the Quick Index, or . . .
BINGHAM, Charles H. DOZIER, Anthony W., Jr. KELLY, Andrew J. SKINNER, William M.
BYERS, James W. EDWARDS, Alfred M. McWILLIAMS, John C. WENTWORTH, Orrin S.
CONWELL, James JACKSON, William SKELLENGER, Charles K.
Funeral services for the late Charles H. Bingham, member of the Veterans' Home who passed away several days ago, will be held this afternoon at two o'clock at the Veterans' Home, under the direction of the Treadway parlors. Interment will be in the Veterans' Home cemetery. Native of Summit County, Maine, born January 1843. On 5 August 1866, Charles married Sarah Halterman in McDonough County, IL. Children born to this marriage were Frank Lester (1866-1955), Lillian Catherine (1872- ? ), Rosa/Rhoda (1872- ? ), Jerima (1875- ? ), Nathan (1876- ? ), Charles Arthur (1877- ? ), Howard S. (1880- ? ), and Maud (1883- ?). By 1868, Bingham was living in Iowa. His son, Frank, was born there about that time. He was still living in Iowa in 1872, when daughters Rosa and Lillie were born. Sometime after 1880, he moved to Garfield County, Washington. where he was enumerated in 1887 with wife Sarah, son Frank, daughters Rosa, Lillie and Jerima, sons Charles, Nathan (Nate) and Howard, and daughter Maud. Although living in Washington at the time, Bingham affiliated with the Grand Army of the Republic Post in Blue Rapids, Marshall County, KS, in early 1886. In 1890, Charles was enumerated in the veterans census schedule, living in Garfield County. His wife Sarah was still living in 1892 when the family was enumerated in the Washington census. Along with Sarah, the household in 1892 included their sons Frank, Nathan, Charley and Howard, and daughters Rosa, Lillie and Maud. Charles was also enumerated in the Washington census in 1898. Sarah was still living at the time, but she died shortly afterward. In early June 1900, Bingham was enumerated in the census as a widower in Pleasant Precinct, Garfield County, WA. His son, Howard S. Bingham (b. 1880 in IA) was living with him. He married Martha Depuy (nee Royse) in Garfield County, WA, on 19 June 1900. In 1910, Bingham was living in West Pomeroy Precinct, Garfield County, WA. He was listed as a veteran of the Union Army, and was living alone, although he was noted as being in his second marriage. He was listed as age 67, living on his own income. He had moved to Walla Walla by 1915, where he was listed as a farmer with his wife Martha. He was also listed there in 1916. Bingham was admitted to the National Soldiers Home in Sawtelle on two occasions: First on 5 March 1917, discharged on 15 August 1919; and second on 23 February 1920, discharged 22 May 1926. His medical conditions at the time he was admitted to Sawtelle included defective hearing, chronic rheumatism, an old gunshot wound to the left hip, and a mildly enlarged heart. He was enumerated twice in Malibu in the 1920 U.S. census, first as a boarder at 2237 Barry Avenue in January, and second as an inmate at Sawtelle in March. He was listed as divorced in the January enumeration. By 1930, Bingham had checked into the Veterans Home of California at Yountville. He was listed there in the 1930 as a patient, age 92, divorced. He died on 10 February 1932 (source: CDI) at the Veterans' Home of California at Yountville, and was buried in George C. Yount Pioneer Cemetery on 13 February 1932. Inscription on the family headstone: Charles H. Bingham | 1843 - 1932 | Co. B 16 Illinois Inf. | Clara E. Bingham | His Wife | 1840 - 1929. "Charles H. Bingham" enlisted on 1 March 1862 at Bird's Point, MO, and was mustered as a Private into Company B of the 16th Illinois Infantry regiment on the same date. He was described at the time of enlistment as being a resident of Macomb, McDonough County, IL; age 21; height 5'6"; hair black; eyes dark; complexion dark; native of Summit County, ME; occupation farmer. He was discharged on 30 March 1864 at Rossville, GA, in order to re-enlist. He re-enlisted as a veteran at Rossville, GA, on 10 March 1864, and was mustered out at Louisville, KY, on 8 July 1865. He joined Robert Hale Post, No. 328, Grand Army of the Republic, based in Blue Rapids, Marshall County, KS, in the first quarter of 1886. Word was received here today of the death of Rev. N. S. Buckner, which occurred yesterday, presumably at his home at Pacific Grove. He had been in poor health for some time and his death was not unexpected. He was a retired Methodist minister and made his home in Calistoga for several years, and owned property here at the time of his death. He was a veteran of the Civil War and was a man universally liked and respected. He was aged about 75 years. It is reported that the funeral is to be held here, but this paper is unable to learn definitely. The funeral of the late Rev. N. S. Buckner was held at Yountville Monday and interment was made in the cemetery there beside two of his children. Mr. Buckner died at his home at Pacific Grove. He is survived by a widow and two sons, Rev. H. H. Buckner and Robert Buckner. Preacher, Educator and Civil War Veteran Answers the Final Call. Rev. Nickerson [sic] Buckner, of Pacific Grove, Cal., died at his home April 18, 1918, at the ripe old age of 78 years. Rev. Buckner for many years was a preaching elder in the M. E. Church in the state of Kansas, also preached at many points in California in and at Takoma [sic], Washington. He was also president of a college at Ashland, Oregon for a time, but most of his life was spent in preaching the gospel, and his life’s work was well crowned with success. He was loved, honored, and respected wherever he was known. Rev. Bucker was born and grew to manhood in Clark County, Ill., and was one of Illinois' most favored sons. At the beginning of the Civil War he was among the first to volunteer and entered the service as one of General Grant’s regiment, the 21st Illinois, and endured the hardships of many battles until the end, and was honorably discharged. After the war he returned to his life’s work, that of a pastor, and was faithful to the last. Rev. Buckner was a brother of our old friend E. Buckner, of this city, who has the honor of being the last living member of that distinguished family of eleven children, 7 boys and 4 girls. Mr. Buckner is much grieved by the death of his last brother and has the sympathy of his many friends. May he live many years to safeguard the old family name of Buckner. Rev. Nixon Buckner, of Pacific Grove, California, died at his home April 18 at the age of 78 years. He was for many years a presiding elder in the M.E. church in the State of Kansas, also preached at many points in California and in Tacoma, Washington. He was also president of a college in Ashland, Oregon, for a time, but most of his life was spent in preaching and his life's work was well crowned with success. He was loved, honored and respected where ever he was known. He was born and grew to manhood in Clark County. At the beginning of the civil war, he was among the first to volunteer and entered the service in Grant's regiment, the 21st Illinois Infantry and endured the hardships until the end of the struggle. After the war, he returned to his life's work, that of a pastor. His brother Elisha of Momence is the last of that distinguished family of eleven children - seven boys and four girls. He was the uncle of Mrs. Merrick Cox and Mrs. Frank Buckner of Marshall and Mrs. Ben Crow of West Union. Born near York, Clark County, Illinois, October Eleventh, Eighteen Hundred Forty (1840). My father was a farmer. There were in the family eight boys and three girls. Six boys and two girls lived to man and womanhood. I attended school-such as it was (Subscription School) three months in the year, from the age of seven until I was fifteen years old. My mother died when I was 14 years old. The spring before I was sixteen, I was hired to work a years for a man named George Miller in Coles County, Illinois, at $10.00 a month. He had a large farm. $16.00 a month was the most he paid to any of his men, and yet while I was the youngest yet I did the same work the older men did. When seventeen I commenced to learn the painters trade. Worked at it a year. When 18 drove an ox team of 2 yoke for my father into Wapelo County, Iowa, and during the winter hauled rail for my uncle. The distance was 12 miles. Had to start very early. Got home late at night. Sometimes I was almost frozen. Returned to Clark County, Illinois, and worked one year on a farm for Mr. George Potter, for $13.00 a month. At this time there was great excitement in both north and south, and in April 1861 Fort Sumpter was fired upon by the rebels. When it was known that Sumpter was taken, the war fever raged in the north. A company was enlisted in our county town, Marshall. When Sumpter fell, I went to Marshall, a distance of 12 miles. Found a company being formed and was the 14th man to enlist. 13 had put their names down before I reached the town. The last of April we went into camp at Mattoon, Coles County, with a full company. Joined with two other companies which formed the 21st Illinois Infantry. We remained in camp until the first of June. Went to Springfield the middle of June. Was mustered into the U.S. for three years under U. S. Grant as, (who was) Colonel. Went home to help recruit. Returned the last of the month and on July 1st, 1861, started for Quincy. For four years was marching, drilling, camping, and fighting. We went into Missouri Arkansas (under Steel). Back to Corinth, Mississippi and up into Kentucky after Brag, was in the battle of Pesigville but suffered no loss in our regiment, although some parts of our army suffered much. This was October 2. Went to Nashville, camped until Dec. 26. Started under General Rosencrans to Murphreesboro 22 miles south of Nashville where General Brag, with 40,000 Rebs were stationed. We had about the same number of men. We encountered their outposts the evening of the 30th. Our regiment and the 15th Wisconsin charged a battery which was supported by a brigade of Rebels. We reached the battery but were driven back with heavy loss, several men killed in our company, lost 200 men killed and wounded in our regiment in 20 minutes. The next day, December 31st, the battle opened at daybreak. We were driven back 3 miles, but at noon was reinforced with fresh troops and drove the enemy back.. On the 2nd of Jan. 63, they charged us and were driven back with heavy loss. They then gave up Murfreesborough and went south to Chattanooga. We remained in Murfreesborough till August. In March I received a commission as first Lieutenant Company 79th Illinois Infantry in which regiment I served until the war ended. Was in the battle of Liberty Gap & Chickamagua Ga. Sept. 19th and 20th. At Stone River or Murfreesboro we lost, out of the regiment I was in, 304 men, one more than half that went into the fight. At Chickamagua in the 2 days battle we lost more than half our regiment, killed, wounded and captured. We gained Chatanooga but was shut in there until the last of November when the battle of Lookout Mountain and Missionary Ridge were fought. I commanded my own company and Company A in the battle of Missionary Ridge. After the battle we marched through snow and sleet to Knoxville in East Tennessee. Wet and cold at night and wading through slush, we marched 75 miles to find that Longstreet had attacked Burnside and been whipped. We remained in East Tenn. During the winter. Returned to Chattanooga and started on the Atlanta campaign in May 1864. Was in the battle Rocky Face Ridge -May 14-when brother Colonel Allen Buckner who led the charge was severely wounded. Was in several skirmished and 3 hard battles in the 100 days march to Atlanta-Resacka, the charge over Kenasaw Mountain and Peach Tree Creek were all hard battles. At Resacka and Kenasaw we were repulsed, but repulsed Hood at Peach Tree after the fall of Atlanta. March back toward Nashville to prevent Hoods army going North. Was captured at the battle of Franklin last of Nov. '64. Taken south, finally landing at Andersonville prison on Christmas day Dec. '64 where we suffered untold misery. Was released and reached our lines Mar. 25, 1865. In hospital 30 days. Went to St. Louis. Was sick there in Everet hotel 30 days, then went to join my regiment at Nashville was mustered in as Capt. of my company. Was mustered out of the service at Springfield, Illinois. Reached home July 1st, 1865. Nixon S. Buckner was a native of York, Clark County, Illinois, born 11 October 1840 to William Robert Buckner and Nancy Evans. He was reportedly named for his uncle, Nixon Evans. He was living in Clark County, Illinois, when the Civil War broke out. In 1871, he married Annette Clarissa Huse in Hancock County, IL, and shortly thereafter moved to Elizabethtown, Colfax County, NM, where their first child was born. By 1874, the Buckners had moved to South Fork, Rio Grande County, CO, where their second child was born. Rev. Buckner moved to Kansas from Colorado and was enumerated in Eureka, Greenwood County, KS, in 1875. In 1880, he was in Great Bend Twp., Barton County, KS. In 1883, he was living in the vicinity of Larned, Pawnee County, KS. He moved to Creswell, Cowley County, KS, before 1885, and transferred into the local GAR Post in 1886. By 1890, Rev. Buckner had moved west to Washington State, where he was residing in Centralia Twp., Lewis County, in 1890 (according to the veterans census schedule). In 1892, he was living in Seattle, King County, Washington. By 1900, Rev. Buckner had settled in Sonoma, Sonoma County, CA, and by 1906 he had acquired property in the vicinity of Calistoga, Napa County, but was living in Finley, Lake County, CA. Rev. Buckner returned to Calistoga in August 1907. For a time, the Buckner family lived on the Nagy place, north of town on the county road (Highway 29) near Greenwood Avenue. The Buckners were living in the vicinity of Calistoga in 1910, according to the census, but newspaper accounts suggest they divided their time between their properties in Calistoga, Kelseyville and Pacific Grove in the early teens. By 1915, Pacific Grove was his primary residence. He died on 18 April 1918 at his home in Pacific Grove, Monterey County, CA, and was buried in George C. Yount Pioneer Cemetery on 22 April 1918. His military headstone is inscribed as follows: CAPT. | NIXON BUCKNER | CO. I | 79. ILL. INF. "Nixon S. Buckner" enlisted on 14 June 1861, and was mustered as a Corporal into Co. H of the 21st Illinois Infantry regiment on 28 June 1861 at Springfield, IL. His residence at the time of enlistment was Melrose, Clark County, IL. He was described at the time of enlistment as single, age 20, native of Melrose, height 5'7", hair auburn, eyes blue, complexion light, occupation farmer. He was discharged for promotion on 26 March 1863. "Nixon S. Buckner" re-enlisted at Murfreesboro, TN, on 13 January 1863. He was commissioned as 1st Lieutenant in Co. I of the 79th Illinois Infantry regiment on 24 March 1863. He was promoted to Captain on 24 January 1865, and was mustered into the command of Co. I on 25 May 1865. He was mustered out at Springfield, IL, on 12 June 1865. Nixon S. Buckner applied for and received a Civil War veterans pension on 13 Sept. 1881 (application no. 428810, cert. no. 286318). His wife applied for a widow's pension benefit on 18 June 1918 (application no. 1122157, cert. no. 860458). As a Methodist Minister, Rev. Buckner frequently moved, resulting in a complex trail of membership history in the Grand Army of the Republic (GAR). He joined B. F. Larned Post, No. 8, GAR, based in Larned, Pawnee County, KS, in the second quarter of 1883. He transferred to Winfield Post, No. 85, based in Winfield, Cowley County, KS, in the fourth quarter of 1886. In California, he transferred to Gov. Morton Post, No. 41, Grand Army of the Republic, based in Calistoga, Napa County, CA, and served as Post Chaplain for a number of years up to the time of his death. James W. Byers, a veteran of the Civil War, passed away at a hospital in Napa Wednesday evening after an extended illness. His home was at 115 Coombs street. Mr. Byers, with his wife, moved to Napa six years ago from Provo, Utah. He was a native of Pennsylvania. In addition to the widow, he is survived by one daughter, Mrs. H. A. Ruth, of Brooklyn, New York. The deceased was a member of Napa Post, Grand Army of the Republic, and the Odd Fellows Lodge of Shelley, Idaho. Under the auspices of Napa Lodge, I.O.O.F., funeral services will be conducted at the D. C. Treadway Co. Chapel at 2 o'clock, Saturday afternoon, and burial will be made in Yountville Cemetery. Native of Crawford County, Pennsylvania, born September 1845. He married about 1872. Byers was a farmer in 1900, living Basalt Precinct, Bingham County, ID, with his wife Clara, and daughter Margaret (b. July 1891). Clara was noted as being the mother of three children, one living. By 1910, The family had moved to Provo, Utah County, UT, where they were enumerated in the census. Byers was noted as a "Union soldier" by occupation in the 1910 census. Their daughter, Margaret E. Byers, was still living with them. Margaret had moved out of the house by 1920. James and Clara were still living in Provo, in a house on 5th East Street. They moved to Napa shortly afterward, settling in a house at 115 Coombs Street. James W. Byers died in a hospital in Napa on 10 November 1926, and was buried in George C. Yount Pioneer Cemetery on 13 November 1926. His military headstone is inscribed as follows: JAS. W. BYERS | CO. H | 50 ILL. INF. "James M. Byers" enlisted at Ripley, IL, on 30 September 1861, and was mustered as a Private into Co. H of the 50th Illinois Infantry regiment on the same date. He was described at the time of enlistment as age 18, native of Crawford County, PA; hair black; eyes black; hair dark; occupation farmer; resident of Brown County, IL. He was discharged on 15 June 1862. Byers applied for and received a veteran's pension on 23 January 1890 (application no. 750943, cert. no. 718265). His wife, Clara Byers, applied for and received a widow's pension benefit on 6 December 1926 (application no. 1563245, cert. no. A4-5-27). He was a member, Napa Post, No. 192, Grand Army of the Republic, based in Napa. He appears as a dues-paying member on the Post account book starting in September 1922. Native of Maine, he was probably the son of William and Emeline L. Calden. The family was enumerated in Wilton, Franklin County, ME, in 1850. The family was still living in Wilton in 1860, where Fred R. is found in the household of William and Emeline L. Calden. The father, William, was a manufacturer, born in Sandwich, NH. Frederick was a resident of Wilton when he enlisted in 1864. Calden's son Dana was born in ME about 1868, but by 1870 the family appears to have moved to California. Fred R. Calden appears in Monroe Twp., Colusa County, under the household of an older relative (uncle? ), Albun Calden and wife Mary L. Calden (ages 48 and 44, respectively). Other members of the household were Mary H. (age 21), Martin E. (age 33), Helena (Frederick's wife, age 19) and William (Frederick's son, age 1). By 1880, Calden was living in Elko, NV, where he was listed as age 31, occupation engineer, born in ME, father born in VA, mother born in MD. His household included his wife Helena, and sons Dana (age 12, b. in ME), Guy (age 9, b. in CA) and Fred (age 3, b. in CA). 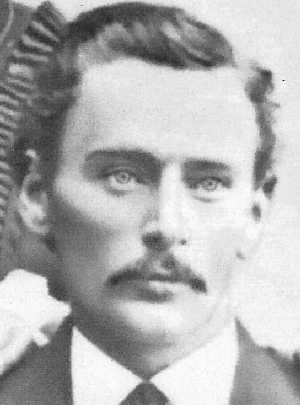 He was living in Colusa County in 1873, Tehama and Calaveras Counties in 1888, Colusa County in 1894. Fred R. Calden was at the Veterans Home of California in 1895 when his pension was increased, and he was living in Yountville (not at the Veterans Home) in 1896, according to the Great Register, described as an engineer, age 47, born in Maine, height 6', complexion light, eyes blue, hair light. He died 12 June 1899, and was buried in George C. Yount Pioneer Cemetery. His military headstone is inscribed as follows: FRED'K CALDEN | CO. M. | 2 ME CAV. "Fred Calden" enlisted on 18 March 1864 (at the age of 18), and was mustered as a Private into Company M of the 2nd Maine Cavalry regiment on the same date. His residence at the time of enlistment was Wilton, ME. He was discharged on 22 May 1865. "Fred R. Calden" applied for and received a veteran's disability pension in Nevada on 16 April 1879 (application no. 279834, cert. no. 352968). Service on the pension index card is noted as Co. M, 2 ME Cav. Native of Ohio, born 4 January 1844. George Church was living in Pacheco, Contra Costa County, CA, in 1880, where he was enumerated as head of a household of eight. The members of the family included his wife Eliza (age 34), daughters Mattie (11), Mary (9), Jessie 7, and Laura (1), and sons Erastus (6) and Oscar (3). George was listed as a carpenter, age 36, born in OH. In March 1885, a son, Albert Andrew Church was born to George and Eliza in Brentwood, Contra Costa County, CA. Albert died in Sonoma County in 1960, and is buried next to his father in George C. Yount Pioneer Cemetery. In 1892, Church was living in Stockton, San Joaquin County, CA, where he was listed in the Great Register of Voters as age 48, born in Ohio, described as height 5' 10-1/2", complexion dark, eyes hazel, hair brown, occupation carpenter. It was noted that he had a smallpox mark on the bridge of his nose. In 1896, George Washington Church was listed in the Great Register as a carpenter at the Veterans Home, described as age 51, born in Ohio, height 5' 11-3/4", complexion dark, eyes hazel, hair dark. George W. Church was enumerated in the 1900 U.S. census as an inmate at the Veterans Home of California. He was listed as a widower, age 56, born January 1844 in Ohio, father born in New York, mother born in Ohio. He also appears in the Great Register of Voters at the Veterans Home that year. His date of death is uncertain. According to family histories, George died in 1904. His wife was reportedly Eliza Wilson Skaggs, whom he married in 1868, and who died in Stockton, CA, on 23 September 1895. His military headstone is inscribed as follows: GEO. W. CHURCH | CO. I. | 31 OHIO INF. "George W. Church" enlisted on 3 September 1861 (at the age of 18), and was mustered as a Private into Co. I of the 31st Ohio Infantry regiment on 19 September 1861. He was discharged for disability on 5 June 1862. George W. Church applied for and received a veteran's disability pension on 22 October 1863 (application no. 34774, cert. no. 697989). Service on the pension index card is listed as Co. I, 31 Ohio Inf. Coroner Kyser received a telephone message from Will Ellis of Yountville, Monday, informing him that an Italian woman had come into his store and said that a man named James Conwell had died at the Ingemundsen place on Dry Creek. The woman did not know what disease the man died of. He had been an inmate at the Veterans' Home about three years before and she went to the home to see if the authorities there would take charge of the remains. Conwell was a native of Ireland, 65 years of age. The Coroner will make an investigation to-day. Coroner Kyser went to the Ingemundsen place in the Napa Redwoods Tuesday and got the body of James Conwell, who died Monday. An autopsy and inquest was held at Napa Tuesday evening, and it was found that death was caused by acute peritonitis produced by strangulated hernia. Deceased was a native of Ireland and 68 years of age. He was a Union veteran, and also a former inmate of the Veterans' Home. The funeral will be held at 10 o'clock this morning in Yountville. Native of Ireland, born about 1831. He died at the Ingemundsen place on Dry Creek, near Yountville, on 8 May 1899. James was described in the 1892 Great Register of Voters for Napa County as age 60, native of Ireland, occupation carpenter, residence Veterans' Home. He was described as height 5' 10-3/4", complexion light, eyes blue, hair gray. He was naturalized in the Superior Court in San Francisco on 4 October 1890. His military headstone is inscribed as follows: LIEUT | JAMES CONWELL | CO. B. | 5TH CAL. INF. The military headstone was furnished by the Stockbridge Marble Co. of Massachusetts under contract of 29 May 1900. "James Conwell" enlisted at Marysville, California, on 29 Sept. 1861, and was mustered as a 1st Sergeant into Company B of the 5th California Infantry on 8 October 1861. He was promoted to 2nd Lieutenant on 10 April 1863. He was mustered out as a 1st Sergeant at Franklin, Texas, on 12 December 1864. After his discharge from the 5th California Infantry, Conwell enlisted at Franklin, Texas, on 10 March 1865 as a Private in Company E of the 1st California Veteran Volunteer Infantry. His dates of muster and discharge aren't documented. James Conwell applied for and received a veteran's disability pension on 20 August 1890 (application no. 928170, cert. no. 770957). Service on the pension index card was noted as Co. B, 5 Cal. Inf. and Co. E, 1st Cal. Inf. Anthony White Dozier, Teacher, Santa Clara, Calif.
First lieutenant Cadet Rangers (cavalry); attached to Butler's brigade, Hampton legion; in service, 1862-65; taken prisoner on John's Island, Charleston, 1864; confined in Fort Delaware for twelve months; for ten months in close confinement in a dungeon for retaliation; teacher in Sumter, S.C., 1865-67; practiced law in Marion, S.C., 1868-1869; principle of a grammar school at Vallejo, Calif., 1870-73; principal of high school, 1873-74; brother of P. C. Dozier, '60 and M. W. Dozier, '67; died in Napa county, Calif., of consumption caused by confinement in military prison, October 31, 1874. He was born at Georgetown, South Carolina, on 23 January 1842. He was one of nine brothers, who were sons of Anthony W. Dozier, Sr. Six of the brothers served the Confederacy, and all returned home at the close of the war. The family moved to California in 1869, with Anthony's brother, Edward Charles Dozier, eventually acquiring a large ranch near Rio Vista. Anthony died of tuberculosis at Yountville on 31 October 1874. His family headstone reads: A. W. Dozier, Jr. | Born In | Georgetown So. Ca. | Jan. 23, 1842 | Died In | Yountville, Cal. | Oct. 31, 1874. The grave is marked with a Confederate flag holder, placed by the Sons of Confederate Veterans and United Daughters of the Confederacy on Saturday, 2 October 1999. Members of Col. Elmer Ellsworth Camp #23, Sons of Union Veterans of the Civil War, also assisted. His brother Leonard Franklin Dozier (also a Confederate veteran) is buried at Tulocay Cemetery in Napa. Anthony and his older brother, Edward, were cadets at the Military Academy in 1862, where they organized a cadet company of cavalry, with Anthony as first lieutenant and Edward as first sergeant. They offered their services to the Confederacy, and were assigned to duty at Long Island in Charleston Harbor. After one engagement with the Union forces, in which the cadet company was distinguished for courage and intrepidity, the company was transferred to Virginia and attached to Gen. Wade Hampton's brigade (Source: Confederate Veteran, v. 27, 1919). Anthony W. Dozier served as 1st Lieutenant in Company F, 6th South Carolina Cavalry regiment. He was listed as a prisoner of war at John's Island, South Carolina, on 9 February 1864. He is one of two known Confederate veterans buried in the George C. Yount Pioneer Cemetery. Henry B. Eckel, a veteran, 82 years of age, a native of New Jersey, passed away at the Veterans' Home hospital Tuesday. Surviving are a brother and sister, Stewart Eckel of San Francisco, and Elizabeth Eckel of Yountville. Funeral services will be held this afternoon at 3 o'clock in the Treadway Funeral Chapel on Coombs street. Interment will be made in Tulocay cemetery. Native of New Jersey, born 26 August 1835. He was described in the 1892 Great Register of Voters in Napa County as a farmer, age 57, native of New Jersey, living at the Veterans' Home. He was described as height 5' 7", complexion light, eyes blue, hair gray. In the 1890 Great Register, he was described as a lumberman in Yount Township. He died at the Veterans Home of California on 10 July 1917. His family headstone is inscribed "Henry B. | Eckel | 1835 - 1917"
"Henry B. Eckel" enlisted on 26 April 1861, and was mustered as a Private into Company K of the 2nd New Jersey Infantry regiment on 1 May 1861. He was mustered out at Trenton, New Jersey, on 31 July 1861. He applied for and received a veterans disability pension on 29 July 1890 (application no. 837535, cert. no. 590072). The pension index card notes that he died at the "Vets. Home, Cal." on 10 July 1917. Native of Pleasant Valley, Jo Daviess County, Illinois. He was a resident of San Francisco when he was admitted to the Veterans Home on 25 March 1909. The Veterans Home roster notes that he was age 64, separated, had been in California for 27 years, suffering from rheumatism, and was a carpenter. He was enumerated in Yountville in 1920, listed as age 75, born in Illinois, occupation house carpenter. His wife Rachel was enumerated in the same household. Alfred died at the Veterans Home on 12 September 1926 (Source: CDI, pension index card). His military headstone is inscribed: ALFRED M. EDWARDS | CO. A | 45 ILL. INF. "Alfred M. Edwards" enlisted at the age of 18 at Mt. McCarroll, Illinois, on 30 August 1861. His residence at the time of enlistment was Pleasant Valley. He was mustered as a Private into Company A of the 45th Illinois Infantry regiment on 20 November 1861. He was wounded in the arm at Shiloh, Tennessee, on 6 April 1862, and was medically discharged for his wounds on 3 November 1862. He was described at the time of enlistment as single, height 5' 7-1/2", complexion light, eyes blue, hair light, occupation farmer. His Veterans Home record notes that he served in the following battles: Corinth, Fort Donelson, Fort Henry, and Shiloh. Alfred applied for and received a veteran's disability pension in California on 1 February 1892 (application no. 1089000, cert. no. 851635). The pension index card notes his date of death as 12 September 1926. Postmaster of Yountville and Prominent Citizen of Upper Valley, Dies Suddenly in the Hospital at Veterans' Home. Walter Ferguson, who had been Postmaster at Yountville for many years and had been a prominent and highly respected resident of that section, passed away at seven o'clock Sunday evening at the hospital at the Veterans' Home. He had been in the hospital for over a month, being treated for rheumatism and a complication of troubles, yet it was not generally realized that his condition was so critical and his death came as a severe shock to the members of his household and his many friends. Deceased was 74 years of age. He had been a resident of California for some forty years. He was a member of Co. I of the 20th Kentucky Infantry during the civil war. Mr. Ferguson was a leading member of the Yountville Methodist church and was ever prominent in church work. Besides his sorrow-stricken widow these children are left to mourn his demise, Mrs. S. H. Miller, whose home is in the east, and Miss Annie, Arthur and Charles Ferguson of Yountville. The funeral will be held at two o'clock Tuesday afternoon from the family residence in Yountville and will be under the auspices of Unity Post, G.A.R., of which deceased was an honored member. The funeral of the late Walter Ferguson took place from the family residence Tuesday afternoon and was attended by many people throughout the valley, and a big crowd of veterans from the Home were present to pay their last respects to their friend and comrade. Walter Ferguson had been a mighty good friend to them during his years of residence in Yountville. Many are the times they had listened to this good man's advise during their wayward spells and had been benefited thereby. The Rev. Dr. U. E. Partridge of St. Helena officiated at the services at the house, and at the grave in the town cemetery Unity Post No. 171, G.A.R., commanded by Ambrose Grow, took charge of the services, which were most impressive. Never before did Funeral Director, Veteran J. B. Pierpont, ever deliver the beautiful Grand Army of the Republic's Funeral Ritual as he did this day. Many tears stained the eyes of that large assemblage during the services. During life Mr. Ferguson (and wife) were prominent in church affairs and he was a man of high attainments and one who had a host of friends who regarded him as a most valuable citizen. On account of the physical condition of the grief stricken wife of the deceased, the firing squad omitted firing the regular number of volleys over the grave. The choir of ladies present sang "Nearer My God to Thee," then the benediction was pronounced by Dr. Partridge and Bugler Lynch sounded "taps" over the grave and the honored and esteemed veteran and citizen was laid to rest. To mourn his loss Mr. Ferguson leaves a sorrowing wife and four children and many other relatives, all living in this county except two, Mrs. F. H. Miller, a daughter in the east, and Charles Ferguson of Vallejo. The other two are: Miss Annie and Arthur. Roll out the Assembly of the Dead. To Gulf and sea, the guns are still. The nesting dove coos to her mate. Where erstwhile plowed the cannonade. Strike hands across the riven years. Over the buried here "cease!" Soft as a benediction falls. Walter Ferguson, Postmaster at Yountville, died Sunday evening at the hospital at the Veterans' Home, where he had been undergoing treatment for the past month. Death was due to rheumatism and a complication of troubles. He was 74 years of age, and had resided in California for the past 40 years. He was a member of Company I of the 20th Kentucky Infantry Regiment during the Civil War. He leaves besides the widow, these children: Miss Annie, Arthur and Charles Ferguson of Yountville, and Mrs. S. H. Miller, who resides in the East. The funeral will be held this afternoon at 2 o'clock from the family residence at Yountville, under the auspices of Unity Post, G.A.R. Walter L. Ferguson was born January 1837 in Tennessee. His household in 1900 included his wife Mary Jane (born Dec. 1854 in Illinois), son Arthur (born Aug. 1885 in Arkansas), son Charles (born Mar. 1888 in Idaho), and daughter Annie (born Feb. 1891 in California). Walter and Mary had been married for 28 years in 1900. Mary was the mother of 10 children, 4 still living. Their other surviving child was Nora Miller (nee Ferguson). Walter's middle name was most likely Leslie, which is the name he used as an alias when enlisting during the Civil War. Walter was appointed as Postmaster in Yountville on 17 September 1897. His wife, Mary, succeeded him after his death, serving until April 1913. Walter died at the Veterans Home of California hospital in Yountville on 27 August 1911. He was buried in the George C. Yount Pioneer Cemetery on Tuesday, 29 August 1911, with military honors provided by the G.A.R. His military headstone is inscribed as follows: W. L. FERGUSON | CO. I. | 20 KY. INF. 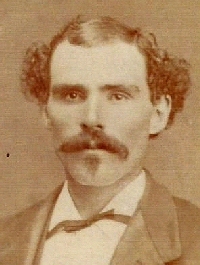 Walter Ferguson served in the Civil War under the alias of "Walter Leslie." He enlisted at Louisville, Kentucky, on 28 December 1863, and was mustered as a Private into Company I of the 20th Kentucky Infantry regiment on the same date. He was transferred to Company D of the 6th Kentucky Cavalry on 17 January 1865. His date of discharge isn't mentioned in the record. "Walter Ferguson" (a.k.a., "Walter Leslie") applied for and received a veterans disability pension on 17 October 1867 (application no. 129318, cert. no. 88536). His wife, Mary Jane Ferguson, applied for, but apparently didn't receive, a widow's benefit in California on 6 December 1911 (application no. 976268). He was a member of Unity Post, No. 171, Grand Army of the Republic, which was based at the Veterans Home of California at Yountville. Private funeral services were held Wednesday afternoon in Napa for William G. Grove, 97, who died at his home in Fresno, Sunday. Burial was in the family plot in Yountville cemetery. Years ago, the deceased made his home on what was known for many years as "the old Groezinger place" in the Western part of Yountville. The residence of Grove and his family, the hospitable home was the scene of many social gatherings. A native of Virginia, Mr. Grove fought with the Confederacy during the civil war. He made his home in Fresno after the passing of his wife in 1930. He is survived by his children, Mrs. Lily Charlton, of Fresno, Mrs. Jessie O'Connell, of Chicago, Miss Pearl Grove, of Fresno, Cordelia Wandersford, of Oakland, and John Grove, of Seattle; a brother, Davis Grove, of Oakland, and three grandchildren and three great grandchildren. Native of Virginia, born 2 October 1846, son of James Rankin Grove and Lucretia Virginia Hite. His father was a native of Augusta County, Virginia, having been born and raised on the old Grove homestead near Summerdean. The father, James Rankin Grove, came to California and settled in Mariposa County, where he died of sun stroke on 17 August 1886. "William G. Grove" was enumerated in the 1860 census in the 1st District (Staunton P.O. ), Augusta County, Virginia, under the household of his parents, James R. and Lucretia V. Grove. He was listed as age 12, born in Virginia, attending school. "William G. Grove" was enumerated in the 1870 census in Township No. 3 (Mariposa P.O. ), Mariposa County, California, as superintendent of a mill. He was listed as age 22, born in Virginia. In 1872, "William Gabriel Grove" was still living in Mariposa County, where he was listed in the Great Register of Voters as a laborer, age 25, born in Virginia, living at Hites Cove. In 1879, "William Gabriel Grove" was living in Russian River Precinct, Sonoma County, where he was listed in the Great Register of Voters as a farmer, age 32, native of Virginia. By 1886, "William Gabriel Grove" had moved to Huron, Fresno County, where he was listed in the Great Register as a farmer, age 37, native of Virginia. The move may have coincided with the death of his father in 1886. William was listed in Fresno County in Crescent in 1888. In 1892, William was still living in Crescent Township (Wheatville P.O. ), and was listed as age 44, height 5' 8-1/4", complexion dark, eyes dark, hair dark. He was again listed as a voter in Crescent Township in 1896. "Wm. G. Grove" was enumerated in the 1900 census in the Sixth Judicial Township, Fresno County, as head of household. He was listed as married (3 years), age 53, born February 1847 in Virginia, occupation farmer. His household included his wife "Willie V." (b. Feb. 1859 in VA), son "John" (b. June 1881 in CA), daughter "Jessie O." (b. Aug. 1883 in CA), daughter "Pearl E." (b. Oct. 1884 in CA), and daughter "Cordelia O." (b. July 1888 in CA). "William G. Grove" was enumerated in the 1910 census in Brooklyn Township, Alameda County. He was listed as married (2nd marriage, 13 years), age 62, born in Virginia, occupation farmer in the flower industry. He was not noted as a veteran. His household included his wife "Willie" (age 45, mother of 2 children, both living), daughter "Cordelia" (age 12), and daughter "Mary" (age 9). "William Grove" was enumerated in the 1920 census in Yount Township, Napa County, as head of household. He was listed as married, age 71, born in Virginia (as were his parents), occupation farmer on a general farm. His household included his wife "Virginia" (age 58). William's wife, Willie Virginia Grove, died at the Arroyo Del Valle Sanitarium (a tuberculosis hospital) near Livermore in Solano County on 20 January 1930. She was buried in the family plot in George C. Yount Pioneer Cemetery in a privte family service. She was a native of Mount Solon, Augusta County, VA, born 5 August 1860, and was William's second wife. "William G. Grove" was enumerated in the 1930 census in Yount Township, Napa County, as a head of household. He was listed as a widower, age 83, married when he was 27, born in Virginia (as were his parents), occupation superintendent of a farm. He was listed as not being a veteran. His household included his cousin "Minnie Grove" (age 70) and a lodger/hired man named "Edward Thompson" (age 65). William died in Fresno, Fresno County, California, on 7 February 1943, and was buried in the family plot at George C. Yount Pioneer Cemetery sometime before 12 February 1943. The grave is unmarked, however, the location of the family plot is known. There are three graves in the plot, occupied by William, his wife Willie Virginia Grove (died 20 Jan. 1930) and daughter Mary Grove (died 4 July 1927). The daughter, Mary, had died at a San Francisco hospital, following an operation. Her funeral was held in the Grove home in Yountville on 7 July 1927. Confederate. His service is not confirmed. Several Groves from Staunton, Virginia, served in the Confederacy. He may be the same man as "W. G. Grove" who served as a Private in Company B of the 3rd Battalion, Virginia Reserves Infantry, of which little is known. He is one of two known Confederate veterans buried at George C. Yount Pioneer Cemetery. During the past week five deaths occurred at the hospital... William Jackson, 64 years of age, serving with the 148th Illinois Infantry. His remains were buried in his plot at the Yountville cemetery Tuesday afternoon by the side of his wife, who died 4 years ago. The Home firing squad fired three volleys over the grave after the services. Native of Sweden, born February 1846. Jackson was living in Yountville in 1900, and was listed in the census as a cobbler, born February 1846 in Sweden, married 7 years, naturalized, having immigrated in 1860. His household included his wife "Anetta" (born April 1823 in Sweden). Annette Jackson died on 20 December 1906. Her wooden grave marker lies next to William's stone. He was enumerated in the 1910 census as an "inmate" at the Veterans Home in Yountville. His age at the time was 63, and he was a widower. The census noted that he was naturalized, and had immigrated in 1863. The CDI notes William Jackson, age 64, died in Napa County on 16 January 1911. He died at the Veterans Home hospital on that date, and was buried in the George C. Yount Pioneer Cemetery on 17 January 1911. The inscription on his military headstone reads: WM. JACKSON | CO. B. | 148 ILL. INF. "William Jackson" enlisted on at the age of 18 at Quincy, Illinois, on 4 February 1865, and was mustered as a Private into Company B of the 148th Illinois Infantry regiment on the same date. He was mustered out at Nashville, Tennessee, on 5 September 1865 (he was reported absent, sick on the same date). He was described at the time of his enlistment as a resident of Canton, Fulton County, Illinois, single, age 18, born in Sweden, occupation shoemaker. He was described as 5' 5" in height, complexion light, eyes blue, hair light. "William Jackson" applied for and received a veterans disability pension on 31 Oct. 1890 (application no. 878056, cert. no. 973457). Service on the pension index card was noted as "P, Co. B, 148th Ill. Inf." An inquest was held at Yountville Thursday evening on the body of Andrew J. Kelly, who died that day at the Eagle Hotel. The jury, consisting of J. D. Wichels, J. L. Shroyer, Edwin James, Chas. Gibbs, D. McVicker and D. A. Casidy, found a verdict that death resulted from "failure of the heart caused by excessive use of alcohol, and we further exonerate the party keeping the place from all blame in the matter." The verdict calls for an explanation. It appears that Kelly was at the Eagle Hotel, off and on, from the middle of August to the time of his death, and that he had been ill most of that time, partly from heart trouble but principally from over-indulgence in liquor. He drew something over seven hundred dollars back pension money and the keeper of the hotel got about five hundred of it for board and "booze." When he died all that he had left was about thirty-five dollars. P. Guillaume, who runs the hotel, has paid Kelly's doctor and medicine bills, and had him decently buried Friday. The death has caused considerable talk at Yountville and the Home. It seems to be a case of a man who wanted to drink and another who was willing to sell him liquor and take all the money he could get for it. Seven hundred a month is pretty "high rolling" for a man of Kelly's age and position. Deceased had served in the California Volunteers from Dec. 11, '64, to Oct. 24, '65, and was mustered in at Marysville and discharged at Fort Point. He was discharged from the Veterans' Home Aug. 16th at his own request. P. Guillaume and wife of Yountville request us to express their gratitude to those who aided them during the last illness and death of their friend, A. J. Kelly, and particularly to Commandant Waltz of the Veterans' Home for sending the pall bearers and giving the deceased a soldier's burial. Andrew Jackson Kelly appears in the 1896 Great Register of Voters for Napa County in the Veterans' Home Precinct. He was listed as age 67, occupation miner, height 5' 8", complexion light, eyes blue, hair gray, missing left thumb, native of Illinois. He died in Yountville at the Eagle Hotel (owned by P. Guillaume) on 16 September 1897. The inscription on his military headstone reads: "AND'W J. KELLY | CO. G. | 8 CAL. INF. "Andrew J. Kelly" enlisted at Marysville, California, on 11 December 1864, and was mustered as a Private into Company G of the 8th California Infantry regiment on 17 December 1864. He was mustered out at San Francisco (Fort Point) on 24 October 1865. "Andrew J. Kelley" applied for and received a veterans disability pension in California on 6 August 1890 (application no. 815453, cert. no. 937601). Service on the pension index card was noted as "G, 8 Calif. Inf." Albert M. McCurdy, after three weeks' illness, died Sunday at the home of J. Walton in Yountville, where he had been boarding. He came from Los Angeles to this county last October, and as a carpenter has since worked in Yountville. He was a native of the District of Columbia, served as a bugler in a California regiment during the war, was aged 46 years. The funeral took place Monday afternoon. Interment in Yountville cemetery. Native of Maine (not Washington, D.C., as noted in the obituary). He was probably the son of John McCurdy, a shoemaker and native of Maine, who was enumerated in Placer County (Ophir P.O.) in 1860, with his wife Margaret A., and children Albert, Ellen G., and James F.
According to a family tree on Ancestry.com, he was born in Calais, Washington County, Maine, on 8 September 1848. Albert married Catherine M. Tryon circa 1880-1881. Their daughter, Pauline Adelaide, was born in January 1882, and a son, Georgie, was born in February 1885. Albert's wife, Catherine, died in 1909. In 1867 and 1871, Albert was living in Truckee, Nevada County, where the Great Register of Voters listed him as age 21, born in Maine, occupation trader. In 1876, Albert was living in Rio Vista, Solano County, where he was listed in the Great Register as a transfer from Nevada County, age 28, native of Maine, occupation trader. In 1879, Albert was living in Sacramento, where he was listed in the Great Register as age 31, native of Maine. In 1880, Albert M. McCurdy was living in Gilroy, Santa Clara County. He was enumerated in the census there, as a boarder in the Southern Pacific Hotel, listed as single, age 32, born in Maine (as were his parents), occupation carpenter. In 1882, Albert was living in Rio Vista, Solano County, where he was listed in the Great Register as age 34, native of Maine, occupation carpenter. In 1884, Albert M. McCurdy had moved to Los Angeles, where the 1884 Great Register of Voters for Los Angeles County lists him as age 36, native of Maine, occupation carpenter. In the 1888 Great Register of Voters for Los Angeles County, he is listed as age 41, native of Maine, occupation carpenter, residence 11-1/2 S. Fort Street. In 1890, Albert was living in Sanger, Fresno County, where he was listed in the Great Register as age 45, native of Maine, occupation carpenter. On 9 August 1892, McCurdy had registered to vote in Oakland, Alameda County. He was listed in the Great Register as age 47, height 5' 8", complexion light, eyes blue, hair light brown, native of Maine, occupation carpenter, residence NE corner 7th and Franklin, Oakland. According to his obituary, he moved to Yountville in October 1892 (although not from Los Angeles as reported). He died at the home of J. Walton in Yountville on 11 June 1893, and was buried in the George C. Yount Pioneer Cemetery on Monday, 12 June 1893. His grave is unmarked. "Albert M. McCurdy" enlisted at Auburn, California, on 13 March 1864, and was mustered as a Musician into Company H of the 4th California Infantry regiment on 29 March 1864. He was mustered out at the Presidio of San Francisco on 30 November 1865. His wife, Catherine M. McCurdy, applied for and received a widow's pension benefit in California on 4 August 1893 (application no. 580774, cert. no. 391294). Service on the pension index card was noted as "H 4 Calif. Inf." J. C. McWilliams, veteran of the Civil War and a widely known resident of the Yountville section, aged 83 years, died at his home there early yesterday morning and the funeral services for him will be conducted from the D. C. Treadway Company Chapel on Tuesday morning at 10 o'clock. Interment will be made in Tulocay. The deceased is survived by his widow and one son. Native of Ohio, born September 1843. He was the son of John McWilliams. He married Mary Louisa Shepard, and had two daughters and one son: Edith Tessora (married Clement Brunner), Edna A. (married Albert Ballou), and Arthur Claire. John was enumerated in the 1860 census in Linn Township, Linn County, Iowa, under the household of his father. He was listed as age 19, born in Ohio. In July 1863, John was living in Linn Township, Linn County Iowa, listed as single, age 22, occupation farmer, native of Ohio, former military service in Co. A, 13th Iowa Inf., enlisted 4 Sept. 1861, discharged 7 Feb. 1862. John was enumerated in the 1870 census in Colfax Township (Stuartsville P.O. ), De Kalb County, Missouri. He was listed as age 29, born in Ohio, occupation farmer, real estate valued at $2000, personal estate valued at $425. His household included his wife Louisa (age 27) and daughter Edith (age 7/12). John was enumerated in the 1880 census in Osceola Precinct, Polk County, Nebraska, listed as married, age 38, born in Ohio (as were his parents), occupation farmer. His household included his wife Mary L. (age 36), daughter Edith T.. (age 10), and daughter Edna A. (age 2). In 1890, John Calvin McWilliams was living in Santa Rosa, California, where he was listed in the Great Register of Voters as age 49, native of Ohio, occupation farmer. He was still living in Santa Rosa in 1892, where the Great Register listed him as age 51, height 6' 2-1/4", complexion dark, eyes blue, hair gray, native of Ohio, occupation farmer. He was also listed in the Great Register in 1896, age 55, description as above, native of Ohio, occupation horticulturist. John was enumerated in the 1900 census in Santa Rosa, Sonoma County, listed as age 56, born September 1843 in Massachusetts [sic], occupation laborer. His household included his wife Mary L. (born May 1848 in MA), and son Arthur C. (born Sept. 1882 in NE). John was enumerated in the 1910 census in Santa Rosa, Sonoma County, under the household of his son-in-law, Albert Ballou, located on Guerneville Road. He was listed as a widower, age 69, born in Ohio, father born in Pennsylvania, mother born in Ohio, occupation canvasser, cutlery and plateware business, Union Army veteran. John was enumerated in the 1920 census in Yountville, listed as married, age 79, born in Ohio, father born in Ireland, mother born in Germany, occupation "none." His household included his wife Elizabeth (age 52, a native of England). The California Death Index notes that John C. McWilliams died in Napa County at the age of 85 on 6 March 1926. His wife's initial was noted as "E."
Inscription on his military headstone: JOHN C. McWILLIAMS | CO. A | 12 IA. INF. "John C. McWilliam" enlisted at the age of 21 on 19 September 1861, and was mustered as a Private into Company A of the 13th Iowa Infantry regiment on 18 October 1861. His residence at the time of enlistment was Mount Vernon. His place of birth was noted as Ohio. He was discharged for disability at Jefferson City, Missouri, on 12 February 1862. "John C. McWilliams" applied for and received a veteran's disability pension in California on 8 March 1892 (application no. 1096413, cert. no. 1072606). Service on the pension index card was noted as "A 12 Iowa Inf." The pension death index card notes that he died in Yountville on 6 March 1926. The index card also references the pension of James H. Mitchell (Co. I, 47th Ill. Inf. ), so there may have been a related claim from a family member. Member, Ellsworth Post, No. 20, Grand Army of the Republic (based in Santa Rosa). He joined the Post on 7 November 1889, and was Post Commander in 1903. Native of Baden (Germany), born about 1836. He married Sarah Sofia Cairns (1852-1901) in Eureka, Humboldt County, on 13 July 1887. Sarah was a member of the Woman's Relief Corps (Auxiliary to the Grand Army of the Republic), and was an inmate at the WRC Home at Evergreen, San Jose, in 1900. In 1878, Henry was living in San Jose, Santa Clara County, working as a glass blower. The Great Register of Voters listed him as age 40, born in Germany, naturalized 19 September 1872 in San Francisco. In 1880, Henry was living in Prescott, Arizona, where the Register of Voters listed him as age 43, born in Germany, naturalized in San Francisco in September 1872. He was still living in Prescott in 1882, where the Great Register listed him as age 45, birthplace and naturalization as above. Henry Rebstock was living at Fort Bragg in 1892, where he was listed in the Great Register of Voters as age 53, born in Germany, occupation laborer, naturalized September 1872 at San Francisco, 19th District Court. Henry was admitted to the National Soldiers Home at Sawtelle, Los Angeles County, on 8 February 1892, suffering from an inguinal hernia and chronic rheumatism. His residence at the time was Fort Bragg, Mendocino County, where he worked as a cook. He was described in his admission record as age 56, height 5' 10", complexion light, married (wife, Sarah S. Rebstock of Fort Bragg). Henry was discharged from the home at his own request on 3 June 1892. In 1896, Henry was living in San Francisco, rooming on the 1st floor at 24 Chesley. He was described in the Great Register of Voters as age 60, height 5' 10", complexion fair, eyes blue, hair light, occupation laborer, born in Germany, naturalized September 1872 in the 19th District Court, San Francisco. Henry was living in Yountville in 1912, where he was listed on the Great Register of Voters for Napa County as a glass blower, Republican. He died 21 June 1913 in Yountville at the age of 77 (Source: CDI, pension death index card), and was buried next to his wife, Sarah, in the George C. Yount Pioneer Cemetery. His military headstone is inscribed as follows: SERGT. | HENRY REBSTOCK | CO. B. | 1 WASH. | TERR. INF. "Henry Rabstock" enlisted at San Francisco on 4 October 1861, and was mustered as a Sergeant into Company C of the 3rd California Infantry on the same date. He was discharged for disability at Camp No. 8 (enroute to Salt Lake City, Utah) on 25 July 1862. "Henry Rabstock" enlisted at San Francisco on 7 August 1862, and was mustered as a Sergeant into Company G of the 1st Washington Territorial Infantry on the 19 October 1862. He later transferred from Company G to Company I. He was discharged in accordance with a General Order from the Department of Pacific on 31 July 1865..
"Henry Rebstock" applied for and received a veterans disability pension in California on 25 February 1889 (application no. 691450, cert. no. 758576). Service on the pension index card was noted as "C 3 Cal. Inf." "I & G 1 Wash. Inf." "Ord. Dept. U.S. Inf." "K 1 U.S. Cav." and "I 12 U.S. Inf." Member, Missionary Ridge Post, No. 156, Grand Army of the Republic, based in Fort Bragg. He held the office of Officer of the Guard in the Post in 1901. Henry's pre-Civil War ("Old War") military service included duty as a Private in Company F of the 1st U.S. Dragoons. He enlisted as "Henry Rabstock" at Baltimore, Maryland, on 22 February 1856, and was mustered out at Fort Crook, California, on expiration of his term of service on 10 January 1861 by General Order No. 26 of 1859. His post-Civil War military service included duty in the U.S. Infantry Ordnance Department (under the name "Henry Rabstock"). He enlisted at Vancouver, Washington, on 20 August 1865, for a 3-year term. He was described at the time of enlistment as age 32, native of Germany, occupation soldier, eyes blue, hair light, complexion fair, height 5' 10", regiment Ord. [Ordnance]. The record notes that he deserted on 27 September 1869, surrendered himself under General Order 102 of the A.G.O. 's office (agreeing to enlist in Co. K, 1st U.S. Cavalry on 3 December 1872, discharged 25 January 1873 for disability as a Private), discharged 7 September 1874 under Department Order 188 of the A.G.O. 1874 at Benecia Arsenal a 2nd _t Private. He enlisted in Company I of the 12 U.S. Infantry at San Francisco on 23 September 1878. He was discharged for disability at Camp Grant, Arizona Territory, as a Private with good character on 12 November 1879. This was his final tour of military duty. George Sampson, a veteran, died at Oakville Saturday, and was buried Sunday at Yountville. He was 82 years of age and a native of Ohio. He served during the Civil War as a member of Co. M, 11th Indiana Cavalry, and claimed to be a cousin of Admiral Sampson. Notes: Native of Ohio, born April 1822 (according to the 1900 census). George Sampson was living in Merced County, California, as early as 1872, where he was listed in the Great Register of Voters as a farmer, resident of Snelling, age 50, native of Ohio. George was still living in the vicinity of Snelling in 1880, where the census listed him in Township 4, Range 14 (Snelling), under the household of a farmer named James Mason. George was listed as a widower, age 57, born in Ohio, father born in Virginia, mother born in Pennsylvania. His occupation was farmer. He appears in Napa County as early as 1890, where he appears in the Great Regiter of Voters in Yount Township, age 68, native of Ohio, occupation farmer. In 1892, he was registered as a voter at the Veterans Home, and was described as age 70, native of Ohio, complexion light, eyes blue, hair gray. He was enumerated in Yount Township, Napa County, in the 1900 census as a boarder in the household of Michael Brughlli. He was listed as a widower, age 78, born April 1822 in Ohio, father born in Virginia, mother born in Pennsylvania. He died on Saturday, 2 March 1901, in Oakville. He was buried in George C. Yount Pioneer Cemetery on Sunday, 3 March 1901. His burial is recorded in an old cemetery ledger, but the exact location of the plot is not known. Military Information: George Sampson enlisted on 30 January 1864, and was mustered as a Private on the same date into Company M of the 11th Indiana Cavalry regiment. He was noted as a resident of Delphi, Indiana, at the time of his enlistment. He was discharged as a Sergeant on 6 June 1865. George Sampson applied for and received a veteran's pension benefit in California on 15 August 1882 (application no. 427293, cert. no. 847884). Service on the pension index card was noted as Private, Co. M, 11 Ind. Cav. He was also noted as having served in the Mexican War (certificate 15_259, Old War file 26,384).. According to family histories, Charles was the son of Jacob and Elizabeth Fauver Schellinger (note spelling variation), born 22 March 1842 in Philadelphia, Pennsylvania. After the Civil War, he returned home to Newark, New Jersey, where he lived until 1881. He then moved to Colehour, Cook County, Illinois, until around 1883 when he moved to Laramie, Wyoming. From Laramie, he moved to Roseburg, Oregon, where he lived until moving to California to be admitted to the Veterans' Home in Yountville in 1905. Charles reportedly married three times. His first marriage was to Ann Elizabeth Hagerman (1832-1881), on 5 December 1864 in Newark, New Jersey. Ann Elizabeth had been deserted by her first husband, leaving her with three children. Charles' second marriage was to Mary Elizabeth Reed (1859-1883), in Newark, New Jersey on 24 May 1881. His third marriage was to Ida Viola West (1874-1918), whom he married in Napa County on 11 May 1910. Charles K. Skellenger was enumerated in the 1910 census at the Veterans' Home of California at Yountville. He was listed as a widower, age 68, native of Pennsylvania, occupation none. Charles died in Napa County on 30 November 1921 at the age of 79. Charles K. Skellenger enlisted at Camp Olden, New Jersey, on 15 August 1861, and was mustered as a Private into Company E of the 4th New Jersey Infantry regiment on the same date. He re-enlisted on 26 December 1863, and was mustered out at Hall's Hill, Virginia, on 9 September 1865. Charles K. Skellenger applied for and received a veteran's disability pension in Oregon on 3 January 1893 (application no. 1142959, cert. no. 1103549). Service on the pension index card was noted as "E 4 N.J. Inf." The pension death index card notes his death as being at Yountville on 1 December 1921. Application for a minor's pension benefit was applied for in California by C. de Colmeonil on 22 July 1922 (application no. 1191981), but the pension was not approved. Here we find engaged in the land and insurance business, W. M. Skinner, Esq., one of the first settlers of the county, and her first county clerk. He is the oldest and best known land dealer in Northern Kansas, and is a good man for a stranger in search of a farm to apply to for information. He is full to the brim of reminiscences of the early days, and withat a pleasant gentleman. He has been elected and re-elected justice of the peace for many years, and at present holds this position. 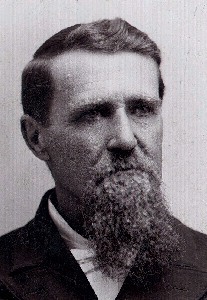 WILLIAM M. SKINNER, notary public, insurance agent and Justice of the Peace, came to Kansas in 1863 on a prospecting tour. He settled in Atchison County, 1869, and farmed two years, then came to Gaylord in May, 1871, and took a homestead near the village. In November, 1872, he was elected Register of Deeds and County Clerk; served in the former capacity two years, and latter three years. Has been notary public since Feb., 1872, and administered the first oath in Smith County for a pension claim. Has served as Justice of the Peace since 1878. There were only about sixty-three bone- fide settlers in Smith County when he first came. He was born in Belmont County, Ohio, Aug. 8, 1834, and lived in his native State until nineteen years old, when he came with parents to Jay County, Ind., where he made headquarters until 1869. Was in Kansas before border warfare and during those hazardous times. Enlisted in August, 1861, in Company (? ), Seventh Indiana Cavalry. Participated in all battles of his command, until wounded in a cavalry engagement Feb. 22, 1864, and discharged July 23,1864, by order of General McPherson. Mr. Skinner is a member of Blue Lodge, A., F. & A. M., and Gaylord Post, No. 162, G. A. R.
No obituary could be found. Numerous legal notices appear in the local newspapers pertaining to the estate. Native of Belmont County, Ohio, born 8 August 1834. He was the son of John C. Skinner and Martha Tetrich (or Todrich). He was referred to as "Judge" Skinner in Napa County in his later years. This was in reference to his service as Justice of the Peace in Gaylord, Kansas, from 1879 into the early 1880's. Prior to being Justice of the Peace, he served as County Clerk for Smith County, Kansas (the first Clerk of that county). He was a farmer for most of his later life, but was active in party politics. William married twice. His first wife was Agnes S. C. ___, who was the first school teacher in Gaylord. She died in Kansas between 1880 and 1885. His second wife was Margaret C. Harbaugh, whom he married around 1885. "W. M. Skinner" was enumerated in the 1880 U.S. census for Gaylord, Smith County, Kansas. He was listed as married, age 45, born in Ohio, father born in Pennsylvania, mother born in Ohio, occupation loan & insurance agent. His household included his wife "Agnes S. C." (age 38), and son "Melvin S." (age 8, born in Indiana). "W. M. Skinner" was enumerated in the 1885 Kansas census for Harlan Township (Gaylord P.O. ), Smith County, Kansas. He was listed as married, age 50, born in Ohio, occupation farmer, came to Kansas from Indiana. He was noted as a veteran, having served in Co. E, 7th Indiana Cavalry. His household included his wife "M." (age 44), and an 8 year old girl. "W. M. Skinner" was enumerated in the 1895 Kansas census for Harlan Township (Gaylord P.O. ), Smith County, Kansas. He was listed as age 59, born in Ohio, came to Kansas from Indiana, occupation farmer, veteran of Co. E, 7th Indiana Cavalry. His household included his wife "M. C." (age 50), a farmer (probably a farm hand) named "E. C. Davis" (age 24), and a child named "Asa Ramsey" (age 12). "William M. Skinner" was enumerated in the 1900 U.S. census in Harlan, Smith County, Kansas. He was listed as married, age 64, born August 1835 in Ohio, father born in Pennsylvania, mother born in Ohio, occupation farmer. His household included his wife "Margaret C." (born February 1868 in Virginia). They had been married for 30 years. Margaret was noted as the mother of zero children. "William M. Skinner" was enumerated in the 1910 census in Yount Township, Napa County, on a farm on the Marin County Road. He was listed as married (2nd marriage for 25 years), age 74, born in Ohio, father born in Pennsylvania, mother born in Ohio, occupation farmer on general farm. He was not noted as a veteran. His household included his wife, Margaret C. Skinner (age 63). He died from a cerebral hemorrhage at the Veterans' Home of California at Yountville on 8 November 1917, and is buried in the George C. Yount Pioneer Cemetery alongside his wife, Margaret, who had died in March 1917. The death certificate listed him as a widower, born 8 August 1833 in Ohio, occupation farmer, father John C. Skinner, mother Martha Todrich. William's estate was administered by his 36-year-old niece, Bess Skinner. His will, dated 24 September 1917, named Bess as his Executrix. He bequeathed $10 to his daughter, Cora E. Ream, and the remainder of his estate to his niece, Bess, and Joseph E. Davis. His real estate, located between Napa and Yountville, had been conveyed to Bess Skinner and Joseph Davis prior to his death, with William retaining a life estate on the premises. The estate was closed in June of 1918. "William M. Skinner" enlisted on 3 September 1863, and was mustered as a Sergeant into Company E of the 7th Indiana Cavalry regiment on the same date. He was mustered out on 25 July 1864. "William M. Skinner" applied for and received a veteran's disability pension on 3 September 1864 (application no. 51972, cert. no. 39320). The pension death index card notes that he died at the "Vets Home, Cal." on 8 November 1917. He was one of the charter members of Gaylord Post, No. 162, Grand Army of the Republic, which organized in Gaylord in 1883. This Post disbanded, and was replaced by Gaylord Post, No. 355, which organized in Gaylord, KS, in 1892. It is unclear whether William joined the Post when it reorganized. He died on 23 July 1895, and was buried in George C. Yount Pioneer Cemetery. His military headstone was ordered by Nelson Holderman, Commandant of the Veterans' Home of California in 1936. His military headstone is inscribed as follows: JOHN WATERS | CO. H | 1 CALIF. INF. "John Waters" enlisted at San Francisco on 17 August 1861, and was mustered as a Private on the same date into Company H of the 1st California Infantry regiment. He was mustered out at Las Cruces, New Mexico, on 31 August 1864. WENTWORTH -- In this city, May 8, 1921, Orin Silas Wentworth, beloved husband of the late Elizabeth P. Wentworth, beloved stepfather of Mrs. I. H. Sproule, H. R. Bingham of Los Angeles, Frank R. Sanborn and Leopold R. Dodge, Mrs. E. Cushing and the late Clarence B. Dodge, and devoted brother of Albert A. Wentworth, a native of Maine, aged 75 years and 1 month. A late member of Co. T [sic - I], 26th Regiment of Maine Infy, Civil War Veterans, and Birds Landing Lodge, No. 284, I.O.O.F. (Napa City and Maine papers please copy). Friends and acquaintances are respectfully invited to attend the funeral Wednesday, at 2:30 P.M., from the parlors of Suhr & Wieboldt, 1465 Valencia St. bet. 25th and 26th. Incineration, Mount Olivet Crematory. Native of Waldo County, Maine, he was born 8 April 1848 (or 3 April 1846). 1867: Nevada County, age 21, born in Maine, occupation miner, residence Buena Vista. 1871: Nevada County, age 21, born in Indiana, occupation miner, residence Buena Vista. 1878: San Francisco, age 30, born in Maine, residence 1037 Howard, occupation agent. 1886: Monterey County, King City, age 40, born in Maine, occupation farmer. 1890: Solano County, Montezuma Precinct, age 44, born in Maine, occupation farmer. 1892: San Francisco, age 46, height 5' 6", complexion dark, eyes blue, hair gray, mole right cheek, occupation gripman, born in Maine, living at 1st Ave, Point Lobos Clement, 2nd floor, room R.
1896: San Francisco, age 50, height 5' 6", complexion dark, eyes hazel, hair gray, occupation gripman, born in Maine, living at 135 Collins. "Orrin S. Wentworth" was admitted to the National Home for Disabled Soldiers at Sawtelle, California, on 8 August 1906, and was discharged on own recognizance on 5 May 1914. His admission record described him as a native of Maine, age 60, height 5' 5-1/2", complexion dark, eyes brown, hair gray, religion Protestant, occupation farmer, residence San Francisco, married, nearest relative Elizabeth P. Wentworth. His disability at the time of admission was noted as chronic articular rheumatism and mitral insufficiency, contracted in Humboldt County, CA, in 1875. "Orrin S. Wentworth" was enumerated in the 1910 census as an inmate at the National Soldiers Home at Malibu Township (Sawtelle), Los Angeles County. He was listed as a widower, age 64, born in Massachusetts, father born in Massachusetts, mother born in Maine, occupation laborer in a repair shop, Union Army veteran. He died in San Francisco on 8 May 1921, was cremated in San Francisco, and was buried in George C. Yount Pioneer Cemetery. His family headstone is inscribed as follows: Orrin S. Wentworth | Born April 8, 1848, | Died May 8, 1921. The top of the stone is decorated with the symbol of the Independent Order of Odd Fellows (I.O.O.F.). "Orren S. Wentworth" enlisted at Belfast, Maine, at the (alleged) age of 18 on 11 October 1862, and was mustered as a Private into Company I of the 26th Maine Infantry on the same date. He was mustered out at Bangor, Maine, on 17 August 1863, at the expiration of his term of service. "Orrin S. Wentworth" enlisted at Belfast, Maine, at the age of 18 on 12 February 1864, and was mustered as a Private on the same date into Company F of the 1st Maine Cavalry. His residence at the time of enlistment was Weld [Waldo], Maine. He was promoted to Corporal in 1865, and was mustered out at Petersburg, Virginia, on 1 August 1865, at the close of the war. "Orrin S. Wentworth" applied for and received a veteran's pension benefit in California on 9 July 1891 (application no. 1037343, cert. no. 1007933). Service on the pension index card was noted as "F 1 Maine Cav." Additional service was noted as "I 26 Me Inf." The pension death index card notes that he died at Yountville on 8 May 1921. According to research by Denise R. Jackson, he was so traumatized by his experience in the war that he would rarely talk about it to anyone. Howard Witmore, of Company H, 193d New York Infantry, a native of New York, died at Yountville, of heart disease. Howard Wetmore, a veteran of the Civil war, was found dead in his bed in a little cottage back of Mrs. Ghirardi's saloon early Sunday morning. An inquest was held by a coroner's jury who attributed his death to heart disease. The funeral services took place Monday afternoon. A number of veterans from the Home attended. Services were conducted at the cemetery by Elder C. E. Edgman. Native of Oneida County, New York, born November 1846 (some records suggest 1843). "Howard James Wetmore" was living in San Francisco in 1898, where he was listed in the Great Register of Voters as a railroadman, age 54, height 5' 8", complexion dark, eyes brown, hair brown, native of New York, living at 737 Mission, 2nd floor, room 220. "Howard J. Wetmore" was enumerated in the 1900 U.S. census in Yount Township, Napa County, under the household of Joan G. Davis. He was listed as a servant in the household, a widower, age 56, born November 1843 in New York, father born in New York, mother born in Connecticut, occupation farm laborer. In July 1901, he was recorded as a laborer at Mare Island Naval Shipyard. Howard James Wetmore was listed as a resident of Yountville in the 1904 Great Register. He died in Yountville on 4 December 1904, and was buried in George C. Yount Pioneer Cemetery on 5 December 1904. His military headstone is inscribed as follows: HOWARD | WETMORE | CO. H. | 193 N.Y. INF. "Howard Wetmore" enlisted for a bounty at Syracuse, New York, at the age of 18 on 21 March 1865. He was mustered as a Private into Company H of the 193rd New York Infantry regiment on the same date. He was mustered out at Harper's Ferry, West Virginia, on 18 January 1866. "Howard Wetmore" applied for and received a veteran's disability pension in Washington state on 11 May 1891 (application no. 1021542, cert. no. 834180). Service on the pension index card was noted as "H 193, N.Y. Inf." Joseph Wulff, aged 74 years and a native of Germany, died in the Napa State Hospital Tuesday. The remains will be taken to Yountville for interment by undertaker Treadway. The funeral of Veteran Joseph Wolff, late husband of Minnie Wolff, who was buried five months ago, took place Wednesday afternoon. After the death of his wife, this aged, blind veteran (who was then in the Veterans' Home Hospital) began to lose his reason and was removed to the Napa Institution, where he died. 'Twas a sorrowing scene yesterday afternoon at the Yountville cemetery when Mr. Wolff's remains were laid away in the grave close to his wife. Many townspeople were there with flowers to strew upon those two mounds. 'Tis the final passing of the couple whose life was not "all roses." Henry and Frederick are the two surviving children. Henry was present at the funeral. Jos. Wolff, an aged resident of Yountville, died Tuesday afternoon near Napa. He had been in ill health for the past year. He was 74 years of age, and a native of Germany. He served in the Civil War. He leaves a widow and other relatives. The remains were taken to Yountville, and were there interred in their last resting place. Native of Germany. He died at Napa State Hospital on 30 August 1910, and was buried at George C. Yount Pioneer Cemetery on the following day. His military headstone is inscribed as follows: JOS. WOLFF | CO. D | 4 N.H. INF. "Joseph Wolf" enlisted at Gilsum, New Hampshire, at the age of 26 on 23 December 1863. His residence at the time of enlistment was Baltimore, Maryland, and he was noted as a native of Germany. He was mustered as a Private into Company D of the 4th New Hampshire Infantry regiment on the same date. He was reported missing at Cold Harbor, Virginia, on 7 June 1864, but was later reported as returned. He was mustered out at Concord, New Hampshire, on 24 June 1865. "Joseph Wolff" applied for and received a veteran's disability pension in California on 30 August 1889 (application no. 725948, cert. no. 919499). Service on the pension index card was listed as " D 4 N.H. Inf." To the memory of the honored soldier dead . . .